A brilliant streamer at a great price, but you might want the 4K-capable Fire TV instead. The choice is usually made for you, depending on which service you have bought into. If you have uploaded music to Google Music, then you are inevitably going to veer towards Chromecast. If your life is iOS based, Apple TV will no doubt be for you and if you are in bed with Amazon you have two choices: the full-fat Amazon Fire TV or the Amazon Fire TV Stick, a device so small and pocket-friendly you'll be constantly wandering what the catch is. Check out our guide to all the best media streamers. And Amazon has just reimagined the stick - there's still no 4K (unlike on the full fat Fire TV), but there is a new remote with Alexa support. The lack of 4K isn't a major issue at this price, especially when Amazon ships an alternative. The Stick is no slouch, with decent specs; quad-core procssor, 8GB of storage, 1GB of memeory and latest gen 802.11ac Wi-Fi. The Amazon Fire TV Stick is a tiny device. It's the size of a thick USB stick and will plug into any HDMI port. So far so slick but there is a small issue - the stick does need to be powered so you have to attach a plug to it. It's not a major issue but it does mean that you will want to plug the device into a HDMI slot that's situated on the back of your television. Otherwise you will have an errant lead hanging out the side of your TV. There is an HDMI extender lead included, however. Thankfully, having the dongle hidden isn't an issue when it comes to the remote control - everything is done via Bluetooth so you don't need line of sight for it to work. Now you can search for shows and movies, watch shows and movies and open apps and players like BBC iPlayer or Plex. However, while Amazon and Netflix content can be searched for and launched via the results, a lot of other apps require you to open them first. Always wanted to be able to say "Put Breaking Bad on my TV" and have it happen, as if by magic? That shouldn't be surprising; after all, we often find with Amazon Echo that Alexa is able to understand what song or album we want, so why not movies? 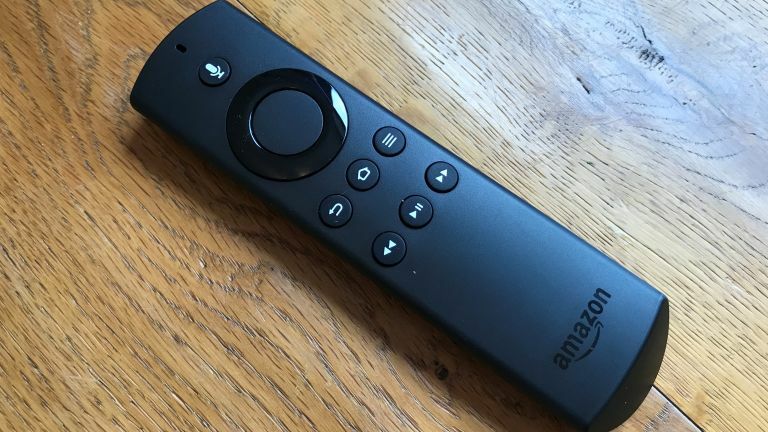 If you have an older Fire TV device you can add voice control via the Fire TV mobile app, or by splashing out £20 on a new remote with a mic for it (NOT this one), if you prefer to rick your futuristic control methods in an old-school way. Alexa on the Fire TV stick also enables you to rewind and fast forward shows and movies. We found the process of doing that more than a little annoying when you have a remote in your hand, but finding shows and movies was a decent experience. Having said that, it is quite good for fast forwarding through the ads as you can simply say "fast forward three minutes" and the ad break will be gone. You can use Alexa to skip to the next episode, but you can’t go back or navigate to a particular episode, which is a shame. One thing that might be good in the future is for Alexa devices to work together, so if you've gone into the kitchen where your Echo is, you can still say "pause my movie" and it will understand what you mean. For now though, Alexa devices work pretty independently (things like alarms are only available on the Echo or Echo Dot you set them on, for example). Alexa isn't just for scouring for content, either. Most of Echo's capabilities and 'Skills' (third-party apps) are now accessible via the Fire TV Stick, with the likes of weather and sports scores gaining a visual element. Alexa is pretty darn compatible these days. So you can say "open Just Eat and ask for my last order" or "dim my lights" at will. Once the Amazon Fire TV Stick is plugged in, you will get a prompt to add in your Wi-Fi password. Obviously there's no ethernet connection, so fingers crossed your Wi-Fi is steady. When you are set up on to your network you can spend the next five or so minutes watching the animated video that guides you through the install process. Or you could do what we did and skip it, dive in at the deep end and hope that you know what you are doing. Fire up the Fire TV Stick and you are presented with myriad options. You have to sign into your Amazon account - if you don't have one, then you shouldn't really be reading this review - and you should also really have Amazon Prime. It's not essential to using the Fire TV Stick but it's like buying a hybrid car and only ever using the electricity part of it - there's more power there so why not use it? Amazon Prime will set you back £79 of course, but you do get unlimited one-day delivery for this and access to Amazon Prime Instant Video, the service that's a rival to Netflix. As you would expect, it works really well through the Fire TV Stick. Prime content is consistently at the front of the user interface and things are split neatly between movie and TV content and you can deep search through genres. Away from Amazon Prime content there's a great selection available on Fire TV devices nowadays - check out this Fire TV apps and games directory. However, there is a bit of a miss as there's no Now TV support. There aren't many streaming devices that Now TV doesn't support, but Amazon streamers are some of them. You can add over 40 premium channels such as Discovery and Eurosport Player - all are available with individual subscriptions so you only pay for the channels you want. One nice touch is that you can pick up shows where you left off when travelling, just plug the Fire TV Stick into a TV's HDMI port, connect to Wi-Fi and continue watching. The other strands of Amazon Fire TV are music and gaming. Anything you have bought through Amazon will come up in the music section of the service and you can also stream from Amazon Prime Music, while there's also Spotify, Deezer, Vevo and various radio apps. Oh, and any stored Amazon Prime Photos will also appear. Gaming remains under cooked. The stick is powerful enough to be a micro console but the games available are essentially mobile apps. So this isn't a device to rival the PS4 - but you can buy an additional controller and pretend that it is. But we wouldn't really recommend it. If you are a Prime member, then the Amazon Fire TV Stick is a superb device that elevates the Prime service and will be everything you want in a streaming stick. If you haven't then there is still a lot to like but all of the Prime business will constantly get in the way of you trying to load iPlayer. Alexa is a great addition to the Fire TV stick and, while the lack of 4K will be a barrier to some, there's little argument - the Fire TV Stick has a strong case to be called the best-all round streaming device available today. It's available for a great price, too. Liked this? Check out the best media streamers.